Your boss comes to you at the end of the day and wants you to create an analytic web application for inventory management. Your first instinct is probably to get down to business coding. First, you create a sketch board, go through the UX and UI, review all the specifications, start development, QA, develop some more, and then QA some more…you know the drill. At Sisense Labs, we’re driven by how people will consume data in the future. So, over the past year, we have been creating a framework for developers to create their own analytics and BI applications – packaged BI capabilities for specific needs – that can be placed anywhere. We call it Sisense BloX. Sisense BloX is the next evolution of our Sisense Everywhere initiative in which we unveiled integrations with products like the Amazon Echo and a smart bulb. It’s another step in Sisense Lab’s pursuit of democratizing the BI world and increasing the value of data for everyone. With Sisense BloX, we transform the world of analytics into an open platform that customizes business applications in order to be more efficient with the way that we interact with our data. Let’s break that down step by step. And, finally, the Sisense BloX framework includes an easy-to-use interface to expose and access many API capabilities directly in the Sisense UI using standard CSS and JSON. What we’ve done is create a low-code environment that makes these APIs accessible to a much wider range of developers and even to non-developers. You can integrate whatever action you want right into your dashboards. Anyone can create an actual BI application using this new UX layer. 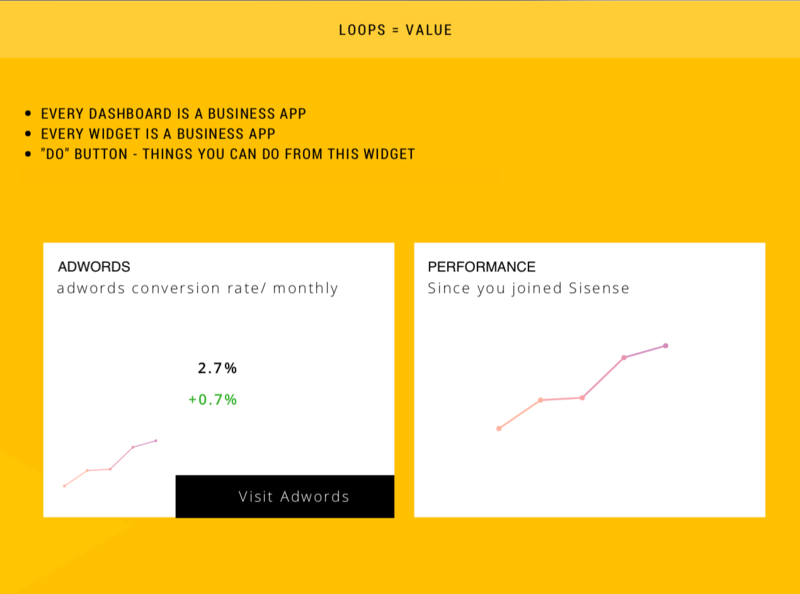 Sisense BloX is currently available as a plugin in Sisense Marketplace but make no mistake, the vision is clear—soon every developer will be able to connect data with actions by using a simple coding framework and add buttons, interactivity, animation, and just about anything HTML will allow. Sisense BloX empowers the data application designers to create business applications with actions wrapped in one container, which create a narrative and have a deeper impact on the organization’s business offering. With Sisense BloX the paradigm shifts from dashboard designers to analytic applications builders and makers. Maybe you want to create a calculator, a slider, or a form that connects and writes back to Salesforce. Sisense BloX allows for this and much more. I’m excited to introduce Sisense BloX to the world.